I don’t want to repeat what I said in my previous articles too much, but we do need to look at the back story to put the Jordan Challenge in appropriate context. Through the late 90s, Michael Jordan was largely absent from basketball video games, usually only appearing in the form of a Roster Player. After a brief run as part of the Legends from NBA Live 2000 to NBA Live 2004, he disappeared once more (though his shoes did remain). 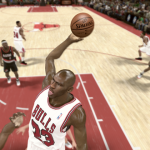 As such, when 2K announced that His Airness would not only be included in NBA 2K11 and become the first retired player to be a cover athlete, but that his career would also be celebrated in the form of the Jordan Challenge, it was a huge deal. Even though historical content wasn’t new to basketball video games, up until NBA 2K11, it hadn’t boasted the same kind of depth or creativity. We’d seen Decade All-Star teams and had access to a pool of historical players that we could add into the current rosters, but now we had actual retro teams with complete starting lineups and a handful of key reserves, as well as accurate branding. 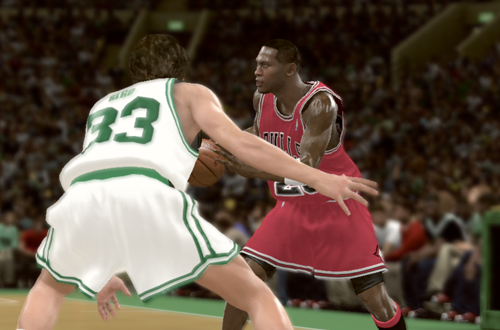 The concept of retro teams had been explored before and appears as cut content in NBA Live 08, but NBA 2K11 finally pulled it off. It didn’t matter that a few players couldn’t be licensed; the big names were there, and we were seeing something we once thought was impossible. The idea of a challenge mode itself was also refreshing. Various WWE games during the Smackdown vs. RAW era had included challenge modes utilising the old school wrestlers that were featured, but in NBA games, there was nothing like that. Sure, it was fun to play with Legends in exhibition games, insert them into the modern NBA to play out some fantasy match-ups, and use them in modding projects, but apart from that, they were underutilised. With the introduction of the Jordan Challenge, we had an opportunity to make use of the historical content in meaningful games. MJ was obviously the star of the show, but several greats from yesteryear shared the spotlight. Conceptually, the Jordan Challenge was straightforward, but with satisfying depth. It was comprised of ten significant moments from MJ’s career, with a goal of replicating his statistical marks from those games. Specifically, there actually eight spotlighted games, a non-specific regular season game against the Hawks in 1990, and the entire 1991 NBA Finals. The eight specific games were his Playoff-high 63-point game, his season-high 69-point game, The Flu Game in 1997, Game 6 of the 1998 NBA Finals, Game 3 of the 1990 Eastern Conference Finals, The Shrug in 1992, Game 6 of the 1996 NBA Finals, and the Double Nickel game against the Knicks in 1995. As you might expect, equalling or besting the amount of points that MJ scored was a recurring goal throughout the Jordan Challenge. However, some games also required getting a certain number of rebounds or assists, or shooting a certain percentage. If the Bulls won the game in question, then clearing the challenge required winning as well as achieving the statistical marks. The 1991 NBA Finals – which were comprised of at least four games, up to a maximum of seven – required MJ to average over 31 points, 11 assists, shoot over 55% from the field, and win the series; just as in real life. Two of the challenges also required holding opponents under a certain number of points. Needless to say, the challenges were…well, challenging! 2K picked some great games to include, and the difficulty in replicating some of MJ’s statistical feats on the virtual hardwood underscored just how incredible he was in real life. They were also made a tad more difficult by the quarter length, which was locked to eight minutes. This was likely done to allow gamers to get through the games quicker, but it left little time to waste, and a narrow margin for error. Winning strategies included chasing the hardest statistic first and using manual subs to ensure MJ played the entire game. 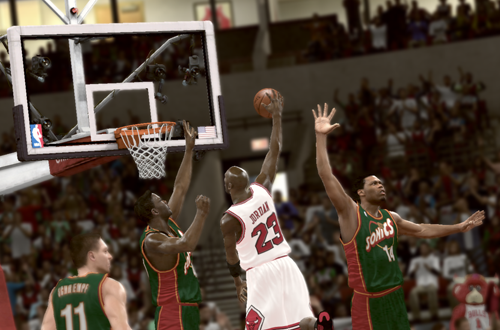 Clearing all of the challenges unlocked MJ: Creating a Legend, which I’ve covered previously. The level of detail and authenticity were the finishing touches that made the Jordan Challenge so special. Most of the historical player faces were quite good for the time, and MJ himself was basically spot-on. He had his signature moves and jump shot animation, and his tongue even wagged when he dunked, a feature still found in NBA 2K to this day. Moments from the games were also authentically re-created, such as MJ shrugging after hitting his sixth three-pointer against the Trail Blazers, Scottie Pippen helping him off the court in the Flu Game, and holding up six fingers for title six. Some were difficult to trigger, but that was just incentive to play the games again! Although the Jordan Challenge remains a brilliant mode, I can offer up some criticism in hindsight. There could have been more variety, as three of the games are from the 1990 season, and although both games were undoubtedly significant, the inclusion of Game 5 of the 1997 Finals and Game 6 of the 1998 Finals meant that two very similar Bulls and Jazz teams were featured. The inability to license Charles Barkley and the 1993 Suns or Reggie Miller and the 1998 Pacers was obviously a drawback as well. A couple of additional challenges would’ve also allowed for more teams to be added, an idea that would ultimately come to fruition in NBA 2K12 with NBA’s Greatest. At the end of the day, however, these are nitpicks and What Ifs that rely on securing the appropriate likeness rights, which is obviously difficult when it comes to Barkley and Miller. I really enjoyed going back a couple of years ago to finish the challenge, and since I picked up the Xbox 360 version cheap off eBay, I’m looking forward to playing through it all again sometime. The Shrug, the 1991 NBA Finals, the 69-point game, and Double Nickel are my personal favourites in the Jordan Challenge, but the whole mode is a fantastic celebration of the Greatest of All-Time. Yes, I said it. Unfortunately, even though we still have a great deal of historical content in recent NBA 2K games, there hasn’t been any challenge modes. 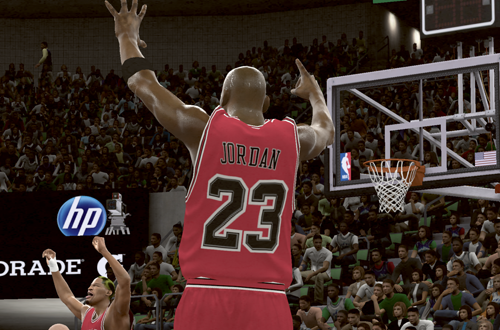 There have been historical challenges and campaigns in MyTEAM, of course, but no standalone modes in the vein of the Jordan Challenge or NBA’s Greatest. I’d love to see a new one that makes use of all the current retro teams, but even if that doesn’t happen, we’ll always have the Jordan Challenge. It revolutionised the usage of historical content in NBA games, pushed the envelope creatively, paid fitting tribute to His Airness, and above all, was a lot of fun. Without a doubt, it helped make NBA 2K11 a true classic.